Almighty God, whose servant William Law taught us to hear and follow your call to a holy life, grant that we, loving thee above all things and in all things, may seek thy purpose and shape our actions to thy will, that we may grow in all virtue and be diligent in prayer all the days of our lives, through Jesus Christ our Lord, to whom with thee and the Holy Ghost be all honor and glory now and forever. Amen. Almighty God, whose servant William Law taught us to hear and follow your call to a holy life, grant that we, loving you above all things and in all things, may seek your purpose and shape our actions to your will, that we may grow in all virtue and be diligent in prayer all the days of our lives, through Jesus Christ our Lord, to whom with you and the Holy Ghost be all honor and glory now and forever. Amen. This commemoration appears in Lesser Feasts & Fasts 2018 with revised leasons & collects. The 9th day of April is the anniversary of the deaths of William Law and of Dietrich Bonhoeffer, theologians and scholars, one Anglican and one Lutheran. Some Christians have fallen into the trap of supposing that their salvation depends on their being sufficiently virtuous, and they need to be reminded that salvation is the gift of God and cannot be earned or deserved. Other Christians have fallen into the opposite error of supposing that the infinite mercy of God means that we are not called on to inconvenience ourselves. (Martin Luther has said that human nature is like a drunkard trying to ride a horse. He gets on and falls off on the left side. He resolves not to make that mistake again, so he remounts, careful to avoid falling off on the left, and promptly falls off on the right.) Law and Bonhoeffer both saw this latter error -- that of complacency and presumption -- as the chief danger in their own times. They undertook to remind their fellow Christians of the importance of BOTH halves of the saying of Our Lord to a sinner (John 8:11): "I do not condemn you; go and sin no more." Both were men whose consciences brought them into conflict with their governments, and both (though in very unequal degree) paid a price for it. 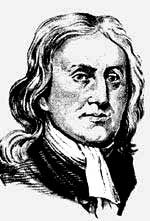 William Law, born in 1686, became a Fellow of Emmanuel College, Cambridge in 1711, but in 1714, at the death of Queen Anne, he became a non-Juror: that is to say, he found himself unable to take the required oath of allegiance to the Hanoverian dynasty (who had replaced the Stuart dynasty) as the lawful rulers of the United Kingdom, and was accordingly ineligible to serve as a university teacher or parish minister. He became for ten years a private tutor in the family of the historian Edward Gibbon (who, despite his generally cynical attitude toward all things Christian, invariably wrote of Law with respect and admiration), and then retired to his native King's Cliffe. Forbidden the use of the pulpit and the lecture-hall, he preached through his books. These include Christian Perfection, The Spirit of Love, The Spirit of Prayer, and, best-known of all, A Serious Call to a Devout and Holy Life, published in 1728. The thesis of this last book is that God does not merely forgive our disobedience, he calls us to obedience, and to a life completely centered in Him. He says: "If you will here stop and ask yourself why you are not as pious as the primitive Christians were, your own heart will tell you that it is neither through ignorance nor inability, but because you never thoroughly intended it." The immediate influence of the book was considerable. Dr. Samuel Johnson said (Boswell's Life of Johnson, ch. 1): "I became a sort of lax talker against religion, for I did not think much against it; and this lasted until I went to Oxford, where it would not be suffered. When at Oxford, I took up Law's Serious Call, expecting to find it a dull book (as such books generally are), and perhaps to laugh at it. But I found Law quite an overmatch for me; and this was the first occasion of my thinking in earnest of religion after I became capable of rational inquiry." Gibbon (as mentioned above) said: "If Mr. Law finds a spark of piety in a reader's mind, he will soon kindle it into a flame." John Wesley calls it one of three books which accounted for his first "explicit resolve to be all devoted to God." Later, when denying, in response to a question, that Methodism was founded on Law's writings, he added that "Methodists carefully read these books and were greatly profitted by them." In 1744 he published extracts from the Serious Call, thereby introducing it to a wider audience than it already had. About eighteen months before his death, he called it "a treatise which will hardly be excelled, if it be equalled, either for beauty of expression or for depth of thought." Some Christians have considered Law's work inadequate, as not sufficiently concerned with Justification by Faith, to which objection Law would doubtless have replied: "But I never offered it as a complete presentation of the Gospel, only as a reminder of the words, 'Go and sin no more,' which are surely a part of the Gospel." My copy of Serious Call is a paperback from Eerdmans, 309 pages with no price marked in or on it. The current Books in Print lists an edition from Westminster Press. Templegate, Bethany House, Pendle Hill Publications, and the Christian Literature Crusade also publish what I take to be anthologies from Law's writings.